One more week to go! 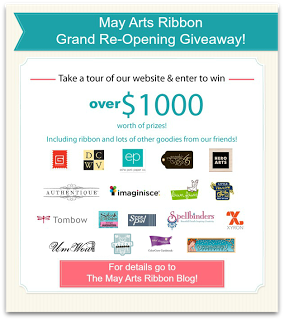 One more week to go until the HUMONGOUS May Arts Grand Re-Opening Giveaway! That means you have a little more time to get in on the fun. The Ribbon Lady has posted all the goodies on the blog and it is truly astounding! There will be 2 lucky winners and a few from selected Ribbonista blogs....including mine! Here's a peek at some of the projects you have may missed. Be sure to head over to the new MA Blog and leave some comment love. I'll be filling the bag in this photo with some scrumptious goodies from May Arts, Hero Arts and PTI plus a few more surprises next week. Be sure to comment here for a chance to win from my blog.